Mettler-Toledo Product Inspection, the world’s leading supplier of checkweighing, metal detection, x-ray and vision inspection solutions for the food and pharmaceutical industries is pleased to invite you to visit the company at interpack 2014, Hall 11, booth B55. The X36 series is the newest innovation of x-ray inspection systems and the most advanced of its kind. X36 provides high detection sensitivity to remove miniscule contaminants. Tailored product solutions guarantee the most efficient and reliable set-ups for all production processes. A new series of checkweighers offer unrivalled weighing precision for high speed production lines, increasing performance by up to 33%. Increased stability and robustness of the system enables smooth product handling for food and pharmaceutical manufacturers at speeds up to 600 products per minute. Improved hygienic design for metal detectors is also presented at interpack 2014 in form of newly enhanced conveyor systems. The systems meet the needs of local and international hygiene and food safety standards such as those under the Global Food Safety Initiative (GFSI) banner including the International Featured Standards (IFS) and the British Retail Consortium (BRC). Comprehensive track and trace and serialisation solutions for every step of the pharmaceutical packaging process. The latest advanced vision inspection systems support up to five cameras and can verify labels while checking the integrity of packaging to guarantee perfect product presentation everytime. A centralised software platform enabling the real-time gathering of performance and quality data from product inspection equipment from multiple locations. The data collected and stored supports compliance with food safety standards. Please follow one of the links below to confirm attendance at the press conference. You can also schedule a booth tour or interview with a Mettler-Toledo representative. 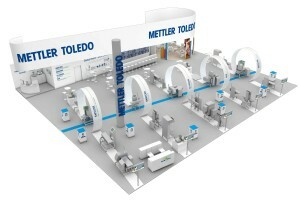 —Yes, I would like to schedule a booth tour and/or interview with Mettler-Toledo. —I cannot confirm my attendance at this point. Please contact me prior to the show. —No, I will not attend. Please email me the press kit. For more information please contact Shariq Sharif +44 207 014 3523 or e-mail [email protected]. Mettler-Toledo Safeline is the world’s leading supplier of metal detection and x-ray inspection solutions for the food and pharmaceutical industries. Together with Garvens Checkweighing, CI-Vision and Pharmacontrol Electronic GmbH (PCE), Mettler-Toledo Safeline forms the Product Inspection division of Mettler-Toledo. Mettler-Toledo develops, produces and markets precision instruments worldwide. The company is one of the largest suppliers of weighing and quality control systems in the world, whose products are used in laboratories as well as industrial processing and food retailing applications.